Nottingham Rugby is pleased to announce the renewal of its community projects partnership with East Midlands-based award-winning industrial supplies specialists, Hall-Fast. This renewed partnership, which will run until 2022, allows for the continuation of the North Notts Community Partnership at Fountaindale SEN School and Ravenshead Church of England School. Hall-Fast Managing Director Malcolm Hall MBE said: “I am very proud that over the last seven years Hall-Fast have been able to support Nottingham Rugby’s Community Department in the delivery of high-quality rugby to tens of thousands of youngsters in Nottinghamshire. Little Ruggers is a family-focused community programme aimed at getting children aged 2-5 playing rugby with their parents. The sessions cost just £2 and there is no need to book prior, just turn up, pick up a ball and play. Steve Smith, Chief Operations Officer at Nottingham Rugby said: “We are delighted to have secured the support of Hall-Fast until 2022. “Their work has helped to increase the opportunities for children within Nottinghamshire to gain access to rugby sessions and in turn has helped to grow the sport of rugby throughout the county. The Nottingham Rugby Little Ruggers scheme relaunched at Paviours Rugby Club on Sunday 30th September at 10am and will run every Sunday throughout the season. For more information on Nottingham Rugby’s community programmes, visit www.nottinghamrugby.co.uk. 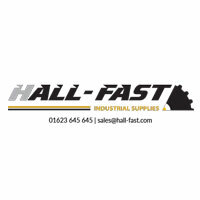 For more information about Hall-Fast Industrial Supplies, head to their website here.